Looking at the forums, one of the most common complaints of parents is that their children 'hate writing' and treat writing practice as some kind of punishment. If you look at how writing is traditionally taught I can understand how so many children get turned off to the fun of writing. It can start when children who lack the strength and fine motor skills (which should be built up by climbing and playing with bricks) are handed a pencil and expected to hold it correctly. If kids aren't ready for writing then it can be physically painful to them - not a great start to encouraging a healthy relationship with a new skill. Many kids aren't developmentally ready until as old as 7, and the rise of tech-based indoor play means that even older kids are only capable of swishing a screen with a finger and find anything else uncomfortable. So with reluctant writers the first question is how can you support their development so that holding a pencil is comfortable - the answer is play, with real objects to hold and manipulate, and plenty of climbing to build up strong hand muscles. Plenty of drawing is a great way to build up confidence with a pencil too. When they can hold a pencil comfortably, and know their letters, using writing as a practical skill with an obvious reason to do it is far more engaging than just writing long lists of copied letters and words. The activity we did last weekend was a good example of how to make writing a relevant skill. 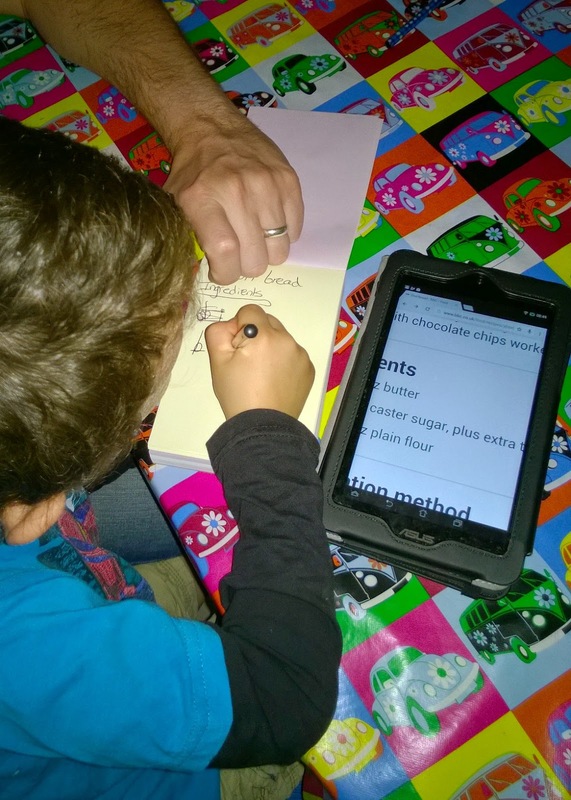 The boys wanted to make biscuits and rather than using the teeny writing in the recipe books we looked up a simple recipe on the internet using our android tablet computer because this gives us the option of zooming in on the bit we want. Ollie then copied out the recipe "so that we don't get food on the computer"and the boys made their biscuits together. 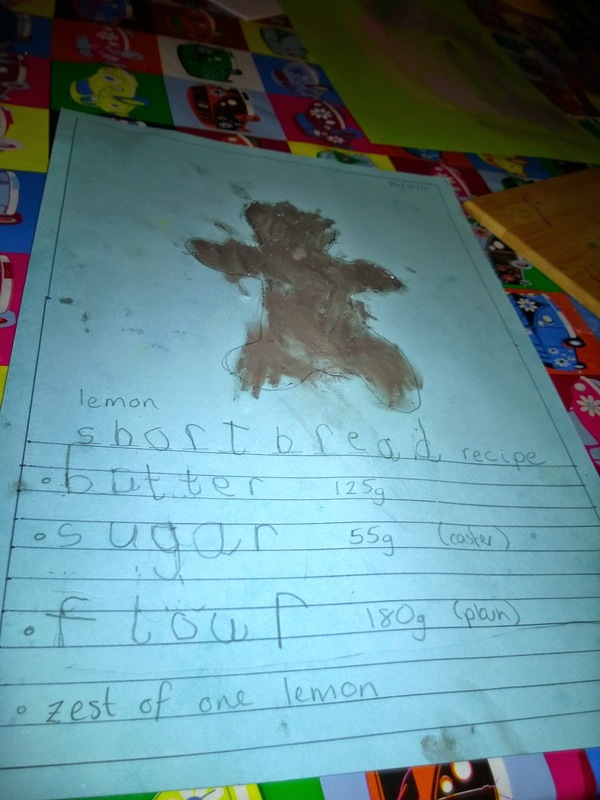 We then decided the recipe worked so well we needed to keep it, so Ollie made a recipe card. Matt drew a border and some lines and held the cookie cutter shape for Ollie to draw around. Ollie then painted it in and copied the recipe onto the lines below (I added in a few bits as by now he was starting to get ready to move on to the next game and there's a balance to be found between encouraging perseverance and not discouraging by insisting on finishing a task when it doesn't really matter). 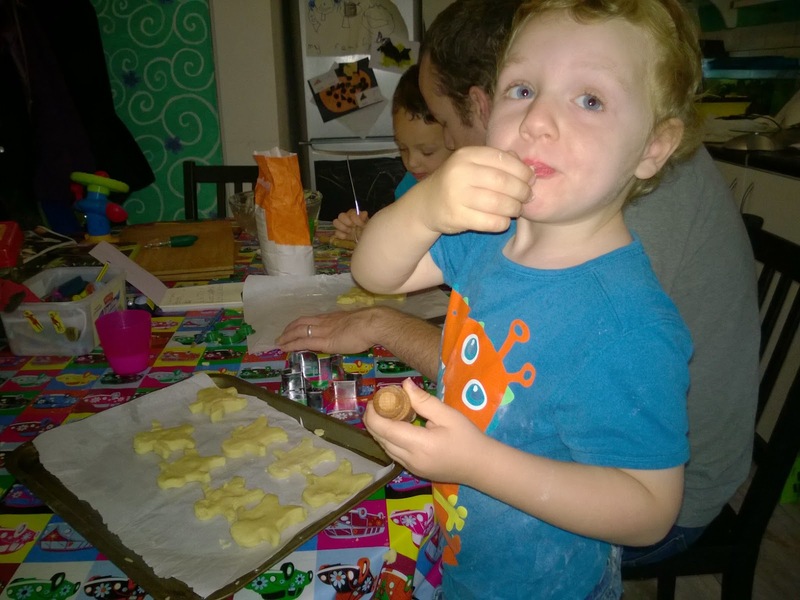 Ollie very proudly pinned his recipe card to the fridge with a magnet and off he went to play. I'm not saying there is no place for handwriting practice as it is a way to encourage legible writing, but the prime aim of writing should not be forgotten - to record and communicate information and ideas. Also, having said that many kids aren't ready for writing until 7, I don't believe in holding kids back who are capable and eager either. Children are individuals and are ready for things at different times. Ollie is writing pretty well at 4 (almost 5), who knows if Toby will be the same, I just hope that we can keep learning as fun as it is now so that they never lose the joy they have in it. They certainly will never be given lines to write out as a punishment!